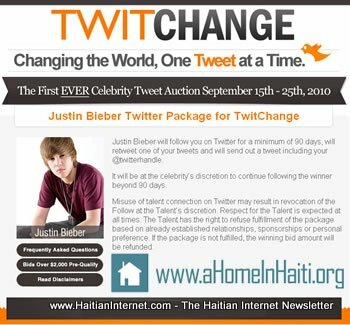 All proceeds from the TwitChange celebrity auction will provide aHomeInHaiti.org the means to finish rebuilding the Miriam Center. The Miriam Center houses, educates and loves on Haitian children with cerebral palsy, severe autism, and other major life challenges and is one of the only facilities of its kind in Haiti. The current facility houses children in the earthquakeʼs aftermath and is extremely overcrowed. These kids need and deserve a permanent home.